On top of every good singer is a cool hat. 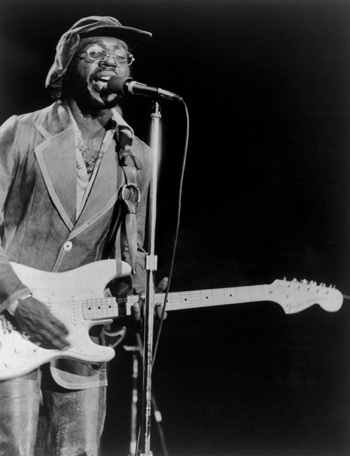 I’m becoming increasingly convinced that Curtis Mayfield was one of the best and most inventive songwriters of the ’60s and ’70s. Certainly he had one of the best voices — that soft, sneaky insistence — and best ensemble sounds, both with the Impressions and on his own. In “Little Child,” the opening track from Mayfield’s famous soundtrack to the blaxplotation flick Superfly, the band sounds alternately like a leaf floating on wind, an interstellar-overdriven rocketship, a funky shake of the hip. And Curtis’s vocal performance here, with subtle variations of timbre and volume, injects the Little Child’s plight directly into the crook of your arm. It’s emotionally complex and geniunely affecting. Today, there’s something awkward about Mayfield’s simple rhymes and earnest exhortations, but they seem a throwback to a less-cynical era. Then again, one might argue that by shoehorning stark “important” social commentary into a cheap ghetto-fabulous cash-cow thriller like Superfly, Mayfield (or the film’s producers) brought about some of today’s cynicism — our preference for guarded ironic cool, our distrust of straightforward statements of positivity, conscience, and passion. As Lester Bangs said (over and over, obsessively), we seem to be using music and art to kill our emotions. Or using music and art to stand in for our emotions. But to counteract the soul-killing, we’ve got Curtis. And the Clash, see below. And the other music we try to present to y’all here at SWR. Expect more posts from me in the coming weeks featuring those ’69-’75 auteurs of soul: Marvin Gaye, Sly Stone, Issac Hayes, George Clinton, Stevie Wonder. I haven’t yet moved beyond the big names, but it’s hard to seek the obscure when the famous stuff is so damn good.